Someone is stealing the flesh and blood of Catholic saints – the questions are who, and why? SATANISTS? Extremists? The deepest, darkest of black markets? This week’s theft of a tiny piece of cloth bearing Pope John Paul II’s blood, from a tiny mountaintop church, is just the most recent event in a chain of thefts stretching back millennia. 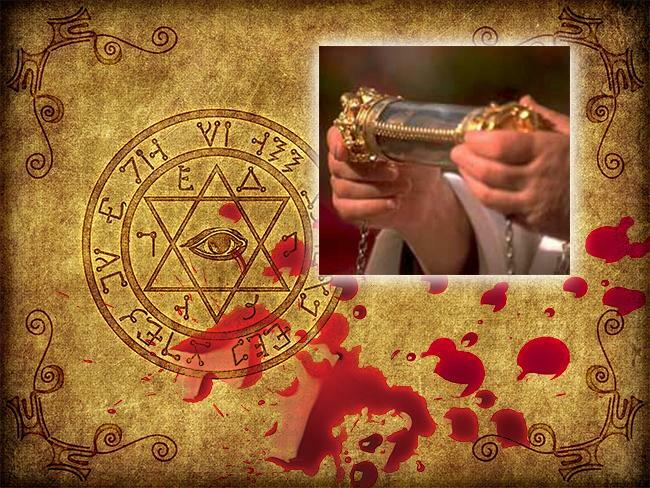 They ususally involve the taking of relics believed to be saints’ remains, with one of the most notable – and bizarre – occuring in 1983 when a relic said to be Christ’s foreskin was stolen. Just why would anyone want to steal pieces of Catholic saints and even the messiah himself? Theories range from secret societies in the vein of The Da Vinci Code to cloning schemes as featured in Hitler horror The Boys From Brazil. Subversive Satanists and “fringe Catholics” have also come under suspiscion. But beneath it all may lurk a sinister black market supplying “stolen to order” artefacts to secretive cashed-up collectors. The latest theft involves a tiny piece of cloth which was a part of the vestments worn by the Polish pope when he was shot by Mehmet Ali Agca in St Peters square in 1981. It had been donated to one of John Paul II’s favourite churches – the tiny San Pietro della Ienca on the mountain trails of Abruzzo, Italy – in 2011. The strange part is, in these days of growing religious indifference, it is the precious gold and gems surrounding the otherwise valueless and suspect human remains which are often discarded. Pope John Paul II is due to be declared a saint in April. Would a tuft of cloth containing a saint’s blood be far more valuable than one containing that of a mere pope …? Perhaps the answer is contained within the stories of some of these holy keepsakes themselves. JUST WHAT IS A RELIC ANYWAY? From hearts and heads, feet and fingers, hair and hands … religious relics are everywhere. Particularly in Italy. Since the Middle Ages it has been a requirement that all Italian Catholic? churches have at least one object of particular reverence. Perhaps the most well-known relic is the Shroud of Turin, said to the burial cloth that wrapped Jesus when he was placed in his tomb after crucifixion. Not only are they items of memorabilia. They are supposed to be infused with the power of God as a result of the miracles enacted by these saints – events which are subjected to Vatican investigations before being accepted by the church. Such objects have always been objects of desire. And relics have always been a “monetised” item. Possession of a piece of a big-name saint would guarantee a church or monastery a steady stream of pious pilgrims – all willing to pay for the experience of getting close to their superheroes. During the Middle Ages, something of a “relic-race” developed, with ever escalating claims of evermore holy discoveries. This ranged from finger bones of local religious heroes through to slithers of the “true cross” upon which Christ was crucified. Their theft is a well-established part of the process. Poverty-stricken remote monasteries would go to extraordinary lengths to get themselves a piece of the action. More political figures would lust after the righteous authority and recruiting power of their armies if a holy object stood at the head of their men. In both cases, if they didn’t launch raids on competing establishments to steal the objects under the guise of righteous indignation (such as in Conques, France, in 866), some would take the simpler course of action and simply make their own relics up (for example, there have been enough pieces of the True Cross to build a decent-sized boat). It’s a tradition of relocation that appears to remain alive and well. 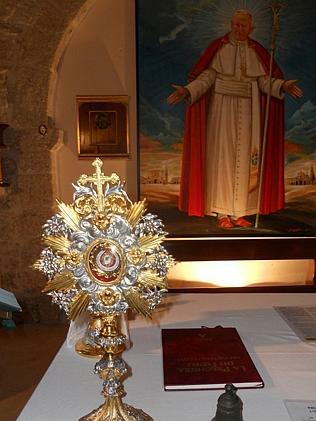 Relic thefts have happened all over the globe, from Los Angeles to the little Italian town of Calcata. Here are a few objects of particularly significant reverence that have been swiped in recent times. CHRIST’S FORESKIN: The Christian messiah was born a Jew. So it follows that he would have been circumcised. What would be a bigger crowd-drawer than the leftovers of Jesus’ bris? At least a dozen churches eventually claimed to possess this intimate piece of history. Most have since been lost to the passage of time. But the Italian congregation of Calcata managed to keep hold of its piece of skin to parade through the streets every January 1 until 1983. This is when the jewelled case and its contents vanished. 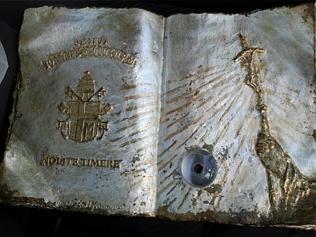 POPE JOHN PAUL II’S BLOOD BOOK: Yes, the recetn clothing incident is actually the second hit on this particular pope’s holy blood. A crystal vial inlaid in a religious tome was pinched from a priest’s backpack as he travelled by train to deliver the precious object to its new home – a church north of Rome. It eventually turned up in the backpack which had been dumped in a field. 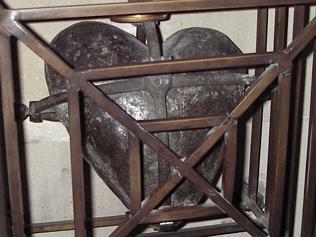 ST LAURENCE O’TOOLE’S HEART: Born about 1128 to a minor Irish noble family, he was taken hostage as a child but later allowed to enter a monastic school. He was noted as being a particularly humble man who helped ease the suffering after England invaded Ireland in 1172. His remains were stolen from a Dublin cathedral in 2012. The iron cage which protected it was pried open and the more expensive items about it left untouched. ST ANTHONY, PATRON SAINT OF LOST CAUSES: Yes, even this saint has had his relics stolen. In 2011, a Long Beach parish in California reported its prized possession – in a 780-year-old gold-and-silver case – was missing. Unusually, and perhaps because of his particular powers, this object was found by police a few days later. The mystic-religious background of these objects has inspired fertile minds for centuries – and petty theft sounds so ordinary when the object is Christ’s foreskin or a pontiff’s blood. Catholic news organisations are leaping to blame Satanism for such diabolic sacrilege. The most fanciful explanations pick up where Jurassic Park left off – and speculate that the preserved DNA within these expensive cases offer the opportunity to clone people proven by the church to have had mystical powers. Here are some of the explanations circulating at the moment. CLONING: This conspiracy theory is nothing new. Several book postulate that the Calcata relic was stolen by the Vatican itself out of fear someone may want to clone Christ himself. Internet chat groups such as Reddit and Inagist have embraced the concept – warning of impending armies of cloned “antichrists” cooked up from the blood of Christ, popes and saints. 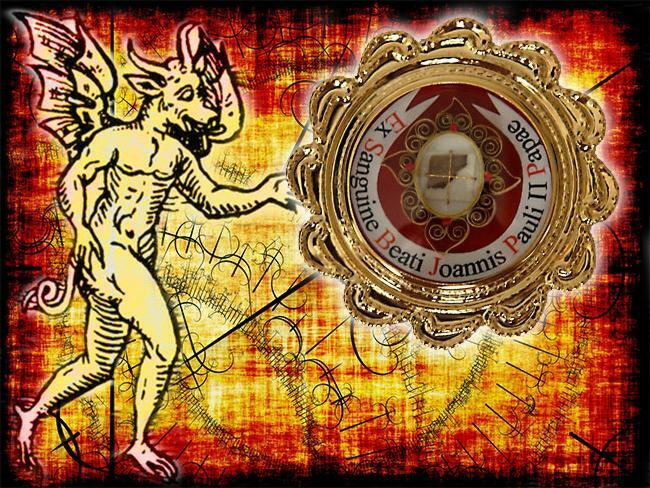 SATANIC CEREMONY: When it comes to the recent Pope John Paul II incident, a Catholic anti-cult organisation insists the blood was stolen for Satanic rituals. 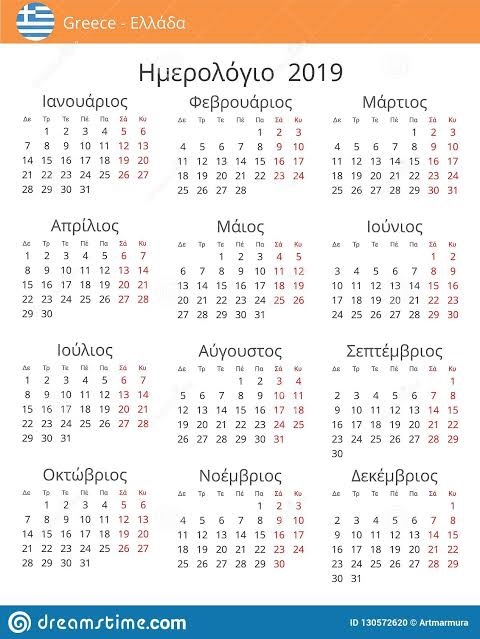 The Satanic “new year” begins February 1, they say. “This sort of sacrilege often takes place at this time of the year,” a spokesman said. It’s an idea embraced by the catholic.org website, arguing it is just the latest act of an increasingly intense “spiritual war” being raged for our souls. EXTREMIST CATHOLICS: Not all Catholics buy the Satanic ceremony line. Instead, some fear these thefts represent the actions of marginal groups within their own church to steal holy objects to furnish their own secret “underground” churches. HOLY-BAY? 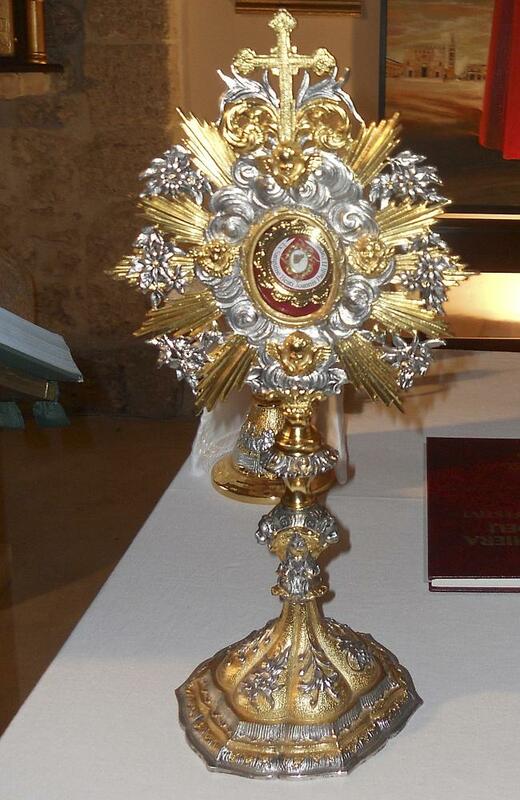 Yes, Italy’s eBay outlet has a section dedicated to the sale of religious relics. And supply of these tightly-held objects is limited – particularly because the Vatican has forbidden their sale or trade. So the opportunity to swipe a relic, particularly one that has not been officially recognised by the church, could be seen as an opportunity for fast cash. But it’s more the presence of such sale sites that demonstrates the value such objects hold in the minds of many. BLACK MARKET: There is plenty of reason to believe that among Europe’s super rich is a clique of collectors gathering as many historic and religious relics as they can. Driving a black market reaching from the forgotten temples amid the forests of South America through to Chinese burial mounds, some of these collections have come to light. For example, in 1991 an Italian crime boss had his home raided and the missing chin of Saint Antonio was recovered. It also ties into the idea of secret societies among the super-rich and influential, such as the Da Vinci Code-style theory that the Knights Templar still exist.